At Thrive, we needed to find email addresses for a few companies we wanted to reach out to and work together with. 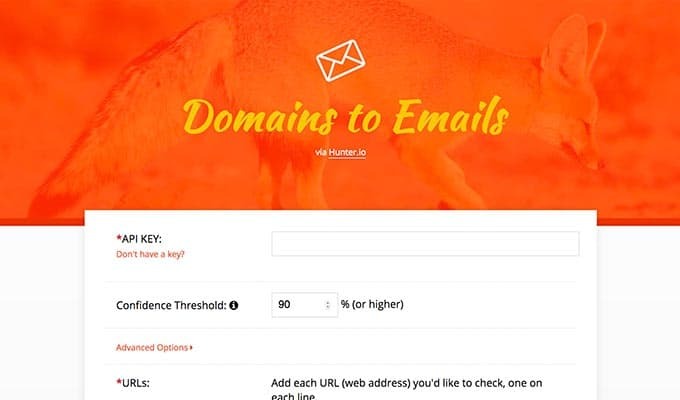 Hunter.io is a great way to find email addresses when all you have is a domain. At Thrive, we needed to find email addresses for a few companies we wanted to reach out to and work together with. The limitation we found with the website itself was that we could only search for one email address at a time – so I built this tool to comb through a list of domains and return email addresses. Once you have a Hunter.io API key (can be obtained for free), you only need a list of domains to be searched – one per line. The result ended up being a list of email addresses for potential clients that took a fraction of the time to obtain!